As rapidly as Istanbul marches toward its modern destiny, street food in this city is still served the old-fashioned way, by boisterous ustas with a good pitch and, sometimes, a really good product. When the bars close, hungry Istanbulites cruise the streets looking for the gas lamp of a rice cart or listening for the call of a sucuk griller, on whom they pounce in a feeding frenzy. As informal as the dining may be, there is an irreplaceable human element – respect – at street food stalls and carts around the city. 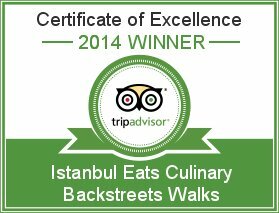 We like to celebrate these tasty Istanbul street eats and support the ustas who serve them, because, to us, there is no kebab without a real, live kebapçı serving it. 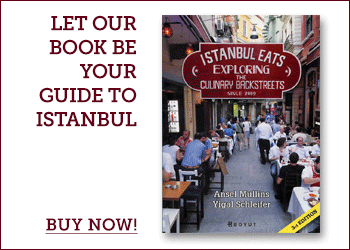 Here’s our (highly subjective) look at four of Istanbul’s best purveyors of street food. In the Turkish Republic, where military service is mandatory, being a soldier is something that is – love it or hate it – an integral part of the Turkish male identity. As good as Ali Usta’s çiğ köfte (literally, “raw meatballs”) may be, we think it must be the soldier’s love of orders that have made Ali Usta and his çiğ köfte such a celebrated street food. 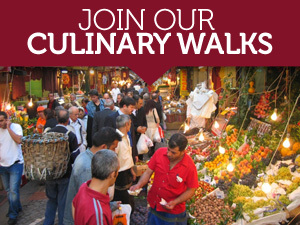 A line often forms outside of the building where Ali Usta’s stand is set up on a side street in Sirkeci. Regulars who know the protocol can usually get their order without summoning the wrath of this peculiar usta. First-timers, take note: hold your bag open to catch flying lemons or risk being pelted; stand back or you’ll get sprayed by chopped lettuce; accept Ali Usta’s gift of one çiğ köfte while you wait, but step out of line in any way and you will be reprimanded. For those who follow the rules, there is a small exclusive seating area just behind Ali Usta, known as the VIP salon.